I’m very, very fortunate to know a pile of smart, silly, incredibly adventurous people. I can round up 18 of them for a monster truck rally and convince six of them to drive 8.5 hours to ride a Ferris wheel on top of a five-story building. We spent 60 hours in St. Louis, not including almost nine hours of driving on either end. And we still liked each other at the end! 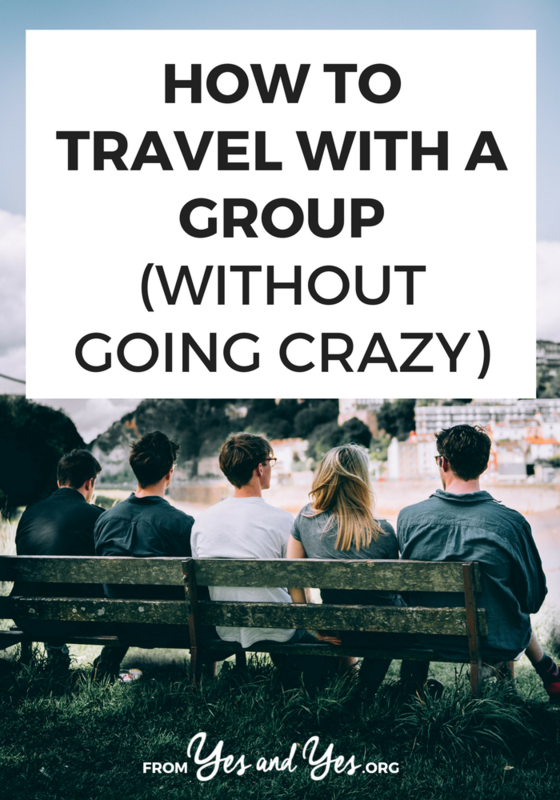 If you want to travel with a big group, here are some tips to make it as awesome as possible. Well dur, right? If it’s possible to not invite The Needy Friend, The Drama-making Friend, or The Prone To Sulking Friend – don’t invite them. The best co-travelers are good natured, adventurous, self-entertaining, and compromising. Even if they’re none-of-the-above, they should be independent so if you want to do something they’re not interested in, they’ll happily do something else on their own. Coordinating the logistics for a large group can get a bit messy and email chains are The Worst. Make things a million times easier by creating a private Facebook group. And you can see who has and hasn’t viewed a post, so you can email or text them any important info you know they missed. In my experience, it’s easiest if one or two people are in charge for the big purchases. After the trip, you can post the final charges on your private Facebook page and your friends can PayPal you the money. For our trip, I booked the hotel and the two friends who contributed their vehicles for driving bought all the gas. I’m a firm believer in the open-ended travel plan – enough planning that you won’t miss the important stuff, not so much planning that you feel smothered or can’t change things up. We planned when we’d see The Important Stuff and researched a barbecue place, but we left plenty of space for alone time and poking around. You know what makes people unpleasant to be around? Being hungry or tired. It sounds mom-like, but bring snacks and water to share and make sure you have plenty of down time. Walking around a new city in the sun is oddly exhausting. You know what else makes people unpleasant? Being in a group for 16 hours (or maybe that’s just me?). Make sure you all have time to spend however you’d like and don’t hesitate to opt out of stuff if you just want to read in the park by yourself. Have you ever traveled with a big group? Share your group travel tips in the comments! Great post, Sarah! I'm actually headed on a group vacation this weekend and these tips are super helpful. I particularly agree with 5 and 6. Even if I just have people in town for the weekend, I think they're applicable. I am off on a group holiday to Iceland in September, which I couldn't be more excited about. Definitely taking snacks and taking the tip about down time to heart – thanks! We've been doing the Facebook group thing, and it's worked a treat. As well as being awesome for organising, it also means you can post articles and photos and get everyone super psyched for the trip. A definite winner. Such valuable tips! I especially like 'naps and snacks' and 'allow for unscheduled/alone time'. Getting space from your friends is vital to maintaining said friendships, especially when on the road! I love your final point – I need to find more professional photographer friends! These are great! I travel with around 30 people really frequently. Long trips, like 3 days in a car one way trips. Generally there are only up to 10-12 in one vehicle at most, but we try to keep it around 8. Still a lot of people to be confined in a small space. Actually we didn't have any problems with that – we'd just yelp someplace with good reviews and a good menu. We had three vegetarians on the trip so that made things a bit easier – we knew going into it that we'd want to choose restaurants with a veggie-friendly menu. What are those spinning tops you all are twirling on? They look like such a fun ride! Mom-ish or not, snacks and naps and alone time are critical for everyone from three-year-olds to group-traveling friends. This is fantastically timely for me! I'm about to start planning a camping trip with a bunch of my friends for later in August and I'll probably wind up coming back to this a few times for a refresher. Bonus: My friends are mostly TV and Film kids, so our photos are going to look fantastic. Where do you find such awesome friends, Sarah? All my friends are so scattered across states and now they're also miles away and busy. I have such a hard time finding one or two people to make plans/ have adventures with. These are great tips, though! I love seeing the pictures of you guys hanging out and having a great time. Awesome tips! My friends and I were thinking of going on a trip together and I never thought about some of these! Hahaha! I love no. 7. I was totally that person at university (though I'm not a professional photographer) and I feel that it was the only reason that I was invited to all the parties. My photos + my comments were what made our days memorable. (Yes, yes, I'm tooting my own horn. But who else if not me?) Thanks for the great tips, Sarah! I think they're applicable to travelling with a buddy or partner, as well! Great tips, I love to travel with my friends. At least 6 people need for an enjoyable group trip. Traveling with a group of close friends it would be fun and full of excitement. A major upside to group travel is the money you can save on rooms and tours. I never travel with group because I thought group travel can't be a good option but now I realized group travel benefits and it offers. best benefit of group travel is that it is much easier to make the arrangements. I love traveling with my family and friends. traveling as a group is that will be able to save a great deal of money. Thanks for sharing the blog! its really amazing and interested. I really love travelling and Traveling with a group of close friends it would be fun and full of enjoy. Thanks a lot and enjoying your travelling with close friends and good luck to every one. Travelling with a group is always entertaining and exciting. I like to go for travel with my friends and family. It gives you a pleasurable time to spend. The tips you have mentioned in your blog are very useful and true. I will follow them during my tours. Right now I am enjoying boston to washington tour with my friends. We have a great fun there. Now we are moving towards Madame Tussauds Wax Museum. What a great list of tips, thanks for sharing!! If you’re looking for a simple, free tool to organize a group trip, check out http://www.mobilized.org/ It’s designed to help travelers take better trips and to help organizers do less tedious work. Ooooh, thanks for the head’s up, Madison!